With Halloween less than a week away now, many of you are getting prepared to throw a perfect but spooky Halloween bash! After throwing four successful Halloween parties myself, I don't claim to be an expert, but I can give some good tips on how my spooky bashes, have been a real success! First of all, before you decide on what kind of food, decorations and fancy dress you're going to have, you need to find a venue. Finding the perfect venue can be challenging, you don't want one that's too big if you're only having 20 guest around to celebrate with you, and you don't want one thats over three hours away from where you live! Check out Venuefinder to find your perfect venue! Tip Two: Date and Time. You need to decide on a date and a time which you think will be best for your Halloween party. Many people think that because your party is Halloween themed, you have to have it on the 31st - incorrect! You're the host, so you choose when you want to have your party! If your party is just for children, don't plan your party too late, on the other hand if it's just for adults, you want your party to be later than 2pm! Anytime from the end of September, you'll start seeing supermarkets and high street stores, filling their shelves with seasonal Halloween buys. Don't buy the first decorations you see, but instead shop around. Once the season is over, many shops will reduce their Halloween ranges, which enables savvy buyers like me to stock up on bargains for next year. Tip Four: The Food and Drink. Unless you have a whole spare kitchen, you really want to leave the food and drink until as late as possible! I prefer to buy all the food and drink items the day before the party, this ensures items like bread and cakes remain fresh, and don't get served stale! As for drinks, check out supermarkets in the weeks leading up to Halloween for special buys on the most popular brands. Tip Five: The Fun and Games. Last but not least, it's time to think of the fun and games you could potentially have at a Halloween bash. Apple bobbing is great for both adults and children, whereas murder mystery style games are best just for the adults, however a Halloween themed parcel parcel would be most enjoyed by children! 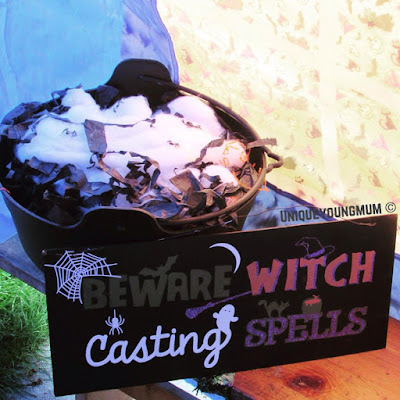 For other Halloween tips and idea's, keep an eye out on Unique Young Mum, where up until the day itself (31st October), I'll be sharing various Halloween buys and tips with you all!